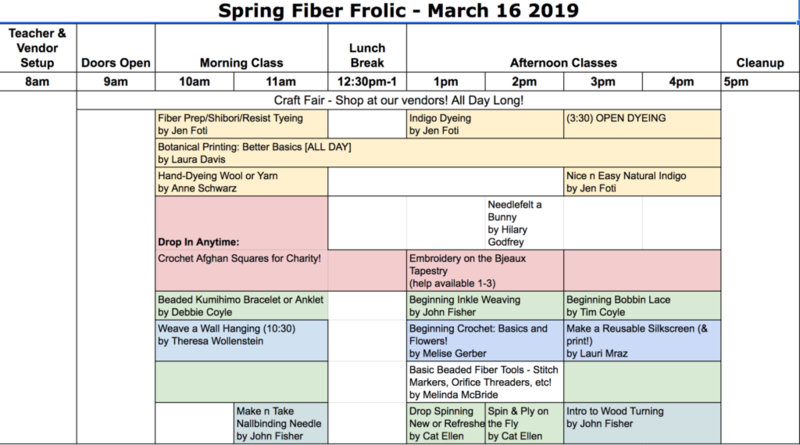 A Fiber Frolic is a one-day event with classes, demos, and a craft fair! We usually hold one in the spring (Feb-Mar) and one in the Fall (Oct-Nov). Next one is March 16! Register Today! Fees: Entry is $50 for the entire day, including all the classes you can fit into your schedule and lunch! Plus there’s a coffee bar, snacks, and a table of freebies anyone is welcome to contribute to or take from. Vendors: $30 for a 10×10 space outdoors or indoors, includes lunch for two. Please plan to bring your own tables. Classes: Class Proposals are accepted anytime. Anyone is welcomes to teach a skill, technique, or complete project!